Brand Nutrition USA will be doing another product demo at Noble Earth in Bristol! Have questions about Kanna or CBD? Stop by and we'll answer them! Have you always wanted to try CBD but you're not sure how it will affect you or what to try? We're here to help! We'll also be selling product, giving away free samples, and giving away informative literature to help you make the best choice about which product to try. Grab a drink from the kombucha/tea bar and come talk about Kanna and CBD! Buy 2 Bud's Bounty CBD Products, Get 1 Free! Because we're releasing so many new CBD products, we thought we should run a special to give you an opportunity to try them all! 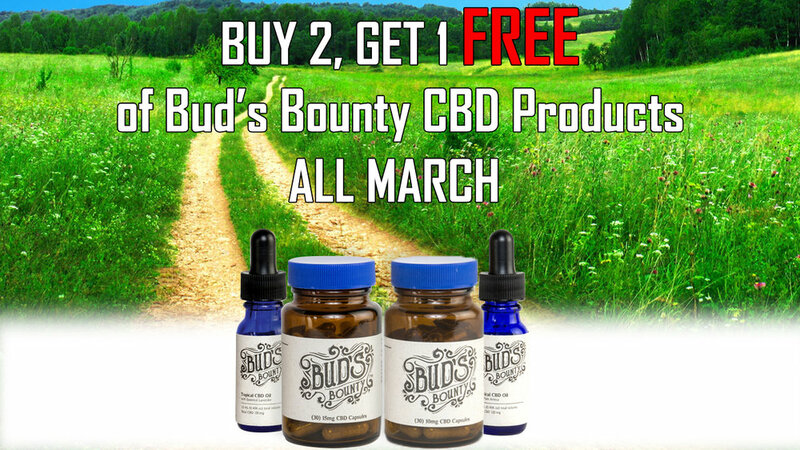 All throughout March, if you buy any 2 Bud's Bounty CBD products, you'll get 1 free! This includes out new 10 mg and 15 mg CBD capsules as well as the Arnica and Lavender topical essential oils with CBD! Check out this amazing review of some of our products over at SparklingReviews.net! CBD, cannabidiol, is a cannabinoid derived from the hemp plant that is rapidly increasing in popularity. Unlike THC, CBD does not produce euphoria or the "high" feeling CBD can be used to help relieve pain, reduce stress, and promote relaxation. Our Bud's Bounty line already contains CBD in capsule, tincture, and cream form, but we've decided to expand and combine the effects of CBD with well-known essential oils to further promote its healing properties. Each one of our Bud's Bounty Topical Oils contains nothing but all natural coconut MCT oil, 98% CBD isolate, and pure essential oils. Arnica montana is a well known plant that has been used in herbal medicine for centuries due to its therapeutic properties. When applied to the skin, it can temporarily relieve pain and soreness in muscles and joints. When combined with the anti-inflammatory and pain relief properties of CBD, our Bud's Bounty Topical Oil with Pure Arnica can provide temporary relief from minor muscle pain and achy joints. Lavender is another well known plant that has a rich history of use in natural products. Lavender oil has traditionally been used for its soothing scent to help relieve stress and support a better night's sleep. Bud's Bounty Topical CBD with Essential Lavender has a rich, soothing scent that helps both the body and mind to relax. When applied to the temples, wrists, or other pulse points, CBD and Lavender oil can work together to help melt away stress and promote a peaceful night's sleep. Saturday January 27th and Sunday January 28th is the annual New Year Resolution Health and Wellness Expo located at Oxford Valley Mall in Langhorne, PA. We're excited to announce that we will be exhibiting this year! Bring the whole family to this kid-friendly wellness event that's complete with health screenings, one-on-one sessions with health coaches, and local vendors! Support your local businesses and work towards a healthy new year all at the same time! The event starts at 11 am both days and runs all day long. We'll be there with samples of our products, information, and freebies for the kids! We'll also be running a special show discount on all orders placed at the time of the expo. Make sure you stop by and enter to win one of our three amazing raffle baskets filled with tons of wellness products designed to help make you a better you! See you there! Brand Nutrition USA has been nominated for the Bucks County 2018 Happening List! Go to Wellness: Dieting/Nutrition and vote for us! What are your New Year's Resolutions for 2018? Our products are designed to support you and help give you a fighting change to reach all those goals you've been dreaming about. Since losing weight and ditching unhealthy habits are some of the most popular New Year's Resolutions, we've decided to make your journey even easier with 20% off Kanna Affects Appetite and Kanna Affects Willpower all throughout January. Kanna works in conjunction with the different blends of supporting herbs in each product to help your body cope with the stress of change that might otherwise lead to you falling back into old patterns. Resist the urge to stick with what's comfortable and make 2018 YOUR year! Members of the Brand Nutrition USA team will be out at Noble Earth in Bristol this Thursday to talk about Kanna Affects and CBD. Have any questions or want some samples? Stop by! All attendees will get $1 off beverages! Come over to Mill Street, grab some samples, try some delicious tea or kombucha, and get your questions answered about our products! Take 20% off Kanna Affects Stress! 'Tis the season for giving! From now until the end of the year, take 20% off Kanna Affects Stress! Kanna Affects Stress was formulated to support your body during the stresses of everyday life and although this time of year can bring a lot of joy, it can also be stressful. Whether it's to support yourself for the rest of the month or a stocking stuffer for a loved one, Kanna Affects Stress is a great holiday supplement! Don't forget, all orders over $75 still ship free until the end of December! And stay tuned for more deals coming up throughout this holiday season! All December long, we're offering free shipping on any order over $75! Stock up on stocking-stuffers for everyone on your list this year and the shipping is on us! Stay tuned for more discounts and deals coming up closer to the holidays!